Industry development and population explosion have rendered the problems of energy shortage and environmental pollution. It is increasingly urgent to find clean and sustainable energy sources to substitute traditional fossil fuels. Semiconductor photocatalysis is one of the most promising and practical solutions to current global energy and environmental issues because it is an efficient way to harvest and utilize solar energy that is generally abundant everywhere on the Earth. Our group focuses on the discovery of novel and efficient visible-light-driven photocatalysts containing 0D (CdS QDs, CQDs, etc. 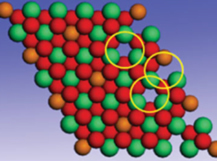 ), 2D (layered double hydroxides, layered Nb oxides, ZnInS nanosheets, etc. ), and 3D (nanovesicles or micro porous, etc.) to meet the above challenges. Furthermore, quantum calculations are also widely applied in our group to allow full exploration of structure-property relationships. By doing so, these catalysts are able to predictably and efficiently convert solar energy into chemical energy through photo/electrochemical water splitting, CO and CO2 reduction process. Reactions, such as oxygen reduction reaction(ORR), oxygen evolutionn reaction (OER), and hydrogen evolutionn reaction (HER), are key parts for various next-generation energy storage and conversion technologies, containing water splitting, fuel cells and rechargeable metal-air batteries. 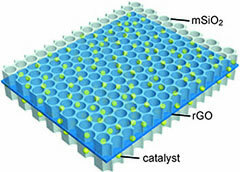 Successful implementation of these technologies hinges on the development of active and durable electrocatalysts. Our group focuses on the discovery and design of novel, low-cost efficient and durable electrocatalysts including metal, metal oxides, metal nitride, layered double hydroxides, and doped-carbon. Furthermore, tuning parameters and quantum calculations are also widely applied in our group to understand structure-property relationships for predicting the activity of novel catalytic materials.